The Roxbury Group unveiled this Kraemer Design Group rendering of the parking garage/condo development that is replacing the Detroit Commerce Building. 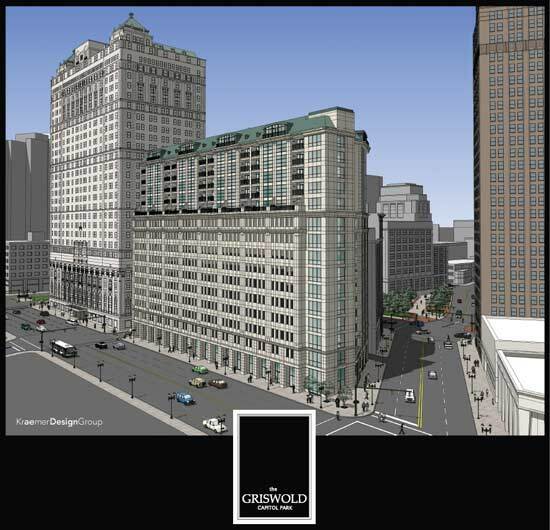 If this rendering is anything close to the final product, it will definitely mitigate the loss of the Commerce Building. David Broderick Tower, originally uploaded by A Dubs. The elements have taken their toll on this house on Erskine in Brush Park. This house is slated to become part of Brush Park Village North. Will it survive the experience? Model D TV has put together a piece on the future development of TechTown. It gives a glimpse at the proposed $1.3 billion, 43-acre, 12-square-block multiuse renewal project partnership with Wayne State University, Henry Ford Health System and General Motors Corp.
City of the Strait, originally uploaded by A Dubs. Detroit's Downtown Movie Palaces is a walk back in time to the Golden Age of Cinema. Authors Michael Hauser and Marianne Weldon have done a wonderful job stitching together the history of movie going in Detroit. Using photos from local archives, as well as Hauser's personal collection, the book provides glimpses of the city's lost treasures as well as rare looks at the survivors of that by gone era. The origins of Detroit's movie palaces can be linked directly to the city's original entertainment district centered upon Monroe Street. Hauser and Weldon highlight the recital halls, vaudeville houses and burlesque theaters that dominated that area before moving on to cover the establishment of Grand Circus entertainment district. They detail the jewels of the necklace district with chapters devoted to the Capitol, Michigan, Fox, United Artists, Wilson, and Gem Theaters. The book wraps up with a look at the lost theaters of Downtown Detroit. Detroit's Downtown Movie Palaces provides a comprehensive photographic record of the dozens of theaters that existed downtown during the first half of the last century. The interior photos of these opulent theaters, both lost and restored, are the true treasures to be found within these pages. It is a tragedy that so many of these architectural gems have been lost or damaged beyond repair. For younger Detroiters who weren't a part of the theater-going experience during that fabulous era, Hauser and Weldon have given us wonderful a taste of what it must have been like. This is another quality addition to Acradia Publishing's Images of America series. Without question, you should make it a part of your own personal reference library. Photos reprinted with permission from Detroit's Downtown Movie Palaces, by Michael Hauser & Marianne Weldon. Available from the publisher online at www.arcadiapublishing.com or by calling (888) 313-2665. Cobo Arena, originally uploaded by A Dubs. Continental Motors, originally uploaded by A Dubs.